Appreciation Monday – Thank you ! I would like to express my heartfelt thanks to YOU as .Shi has reached 1000 members! As a token of our appreciation, we have prepared a new group gift for you! 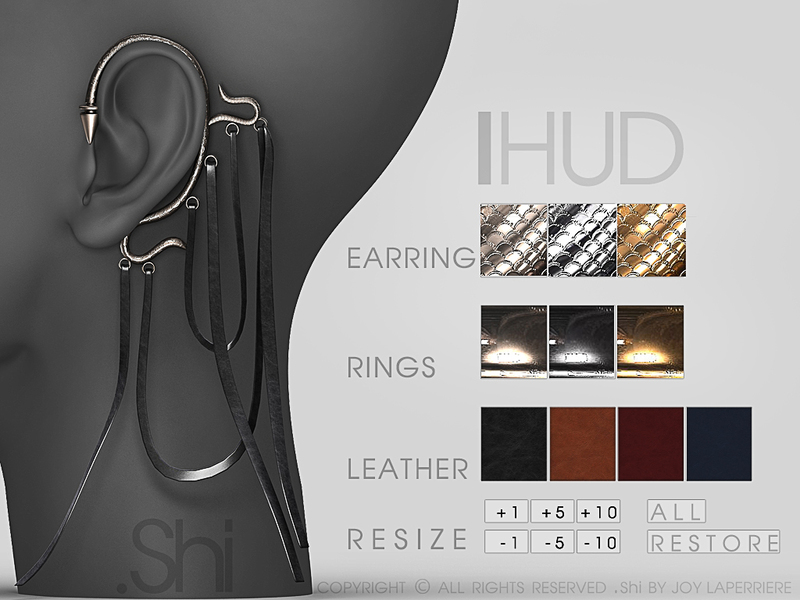 This is the Journey Earring [Unisex] with various texture change options via HUD. You guys made this possible for me, I can’t thank you enough – This means a lot to me and I hope you could spare me some time to read this. As I sit here getting ready to start my Monday, reading updates from my team is one of my top priority. Receiving queries and requests is part and parcel of any business in both Second and Real life. We as management and individuals try our best to attend to it with all fairness & integrity objectively. Although we are management & creators – we are also consumers (we do shop and support other businesses) so we do understand and try our best to understand and meet your needs respectively. In our daily reality, we wake up to screaming needs and commitments. For those of you reading this – most likely in both lives (SL & RL) as well. With that, each of us have a system to sort out our priorities for us to live in an orderly manner – This also applies to any business. Which is why we have certain S.O.P – Standard Operating Procedures in place to execute rules and regulations to ascertain a smooth operation. My heart goes out to my team who represents and mends the fort for me, they are my “Warriors” who takes the front-line while I focus on the core. I like to stress the importance that apart from being representatives for the organization – behind each is a fellow human with real feelings and emotions as well. In a virtual environment like Second life, as cool as it is – many of us come here for a reason or you could say “Escape“. Every one of us, myself included have our own personal issues. Having said that, we (management) NEED to set all that aside as we put on the work hat. We remain objective and do not impose our personal grievance on anyone. Everyday is a war, a fight within ourselves vs our needs and wants. I will like to urge you to keep this in mind, myself included to have Empathy and Grace as we treat another human being with respect. I live under a rock, so no clue what this side story is on who did what to whom, but you are so amazingly correct. In SL managers manage, designers design, but unlike RL jobs these SL avatars have to juggle both lifes. Journey is an amazing person and what you have created to honor her, and given to us for being your followers, groupies, blog hippies, whatever you want to call us, it’s simply gorgeous as all of your things are. Congrats on 1,000 Joy!